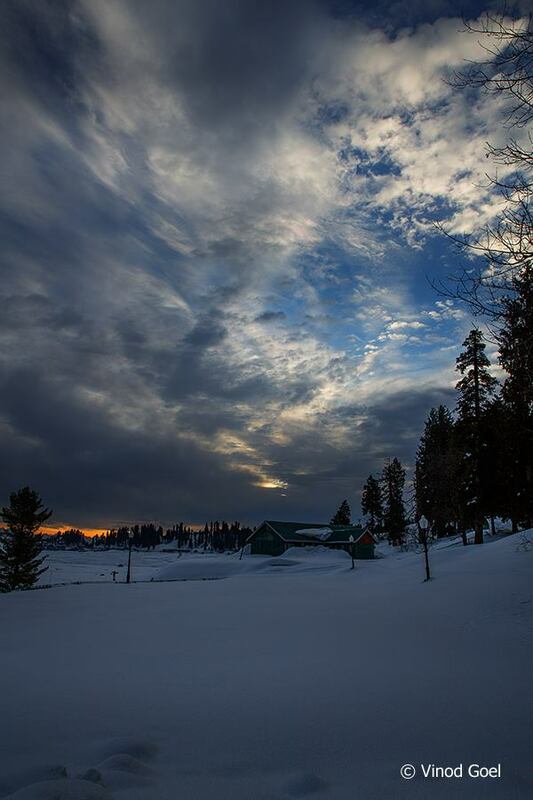 Tourist from all over the country come to Gulmarg in summers to feel and enjoy the green meadows, and in winters too domestic tourists visit to enjoy the snow, while the international tourists come to Gulmarg in winters for skiing. But, I believe in enjoying the nature irrespective of the season. My engagement with nature starts with the Sun rise and ends at Sun set. It was simply unbelievable. The nature showed me many things for the first time. All the three mornings were different and colorful. 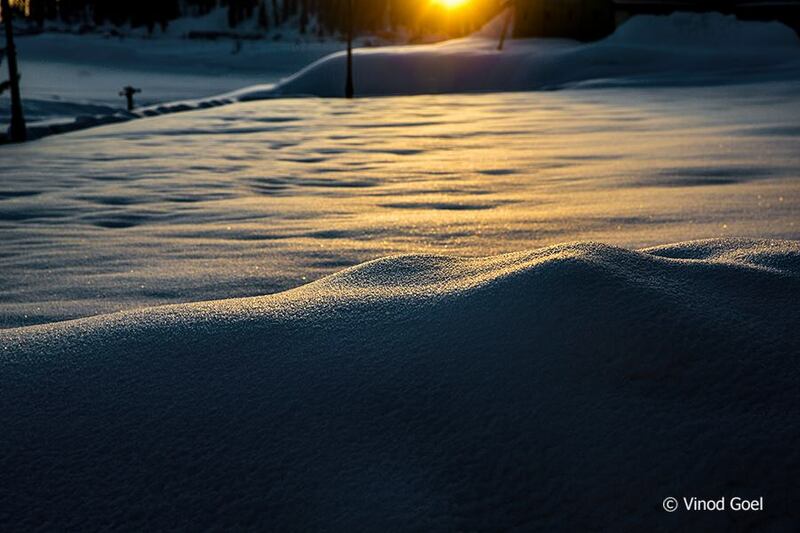 The photographs taken in Gulmarg would speak for themselves. I woke up at 0420hrs of the first morning, since the windows of the rooms were covered outside by deep snow, I had to go out to see the morning … I came out of the room at 0540hrs on 23nd March and found the sky to be overcast. The different colors of the sky were visible from time to time as if nature had prepared itself to play Holi with lovers. That was the time scheduled for festival of Holi in India, and the sky over the Valley indicated those vibrant colors despite the fact that there was no trace of Holi in this part of the country. The next day morning, when I looked outside my hut, the Sun greenish. It was 0651 hrs. The sun was above the horizon. I observed a ring around the Sun creating almost a rainbow. I looked at the Sun for about 5 to 6 minutes. The ring around the Sun kept on increasing with the rising Sun. This was something which I observed for the first time in life. I could not believe my eyes. I had a word with the guest keepers. They said it is called a ‘dhanak “ in Kashmiri. I clicked some photographs of the ring or the halo around the Sun. When I discussed the same with Rajesh Bedi , famous wildlife photographer of international repute, he observed that very few people have the chance of observing such a phenomenon at the hills & I am one of those lucky ones. Almost a month after, I read an article in a newspaper that says Halo around the Sun was observed at 12 noon at Kolkatta on 30th April, 2016. This is also called 22 degree Halo. 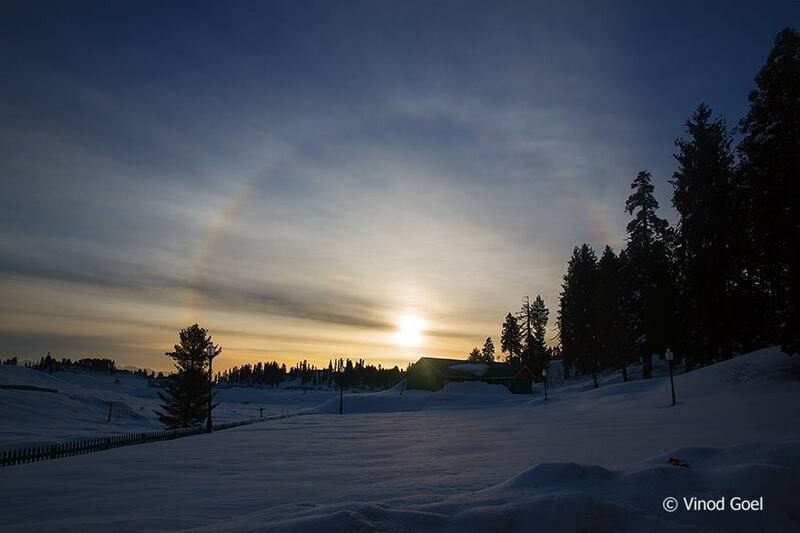 This is optical phenomenon produced by light interacting with ice crystals suspended in the atmosphere. It can have many forms ranging from colored to white rings to arcs and spots in the sky. 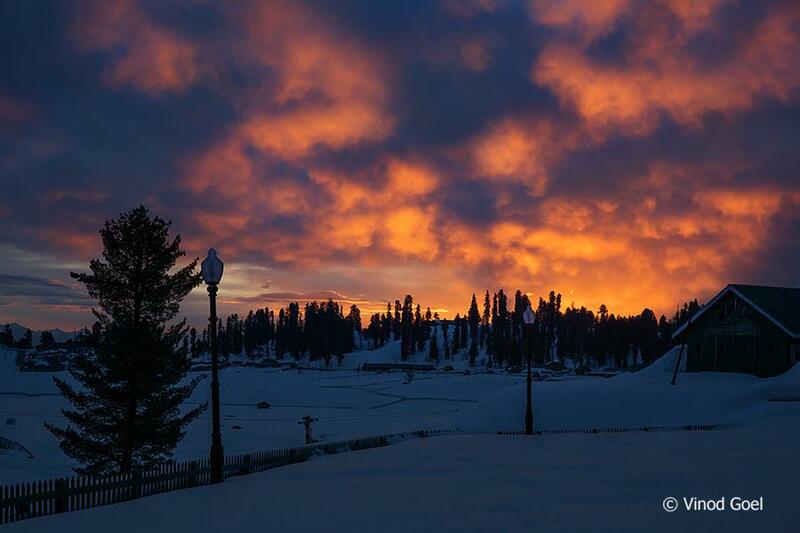 The colors in the sky in the morning before and after the Sun rise and the Halo around the Sun is an extremely rare occurrence, that has certainly made my stay in Gulmarg a memorable one.